While I'm not an expert on describing this concept accurately or from experience, I think it is a great thought and should be mentioned. The large community of makers, hackers, tinkerers, inventors, experimenters, and explorers have a sort of unique mindset of what they do and why. They are not out to destroy (sometimes common definition of hacker), collect junk, or make impractical things. They want to learn, explore, innovate, teach, and help others do the same. From this mindset comes things like open source development, hacker-space communities, being self-taught and self-dependent, and fixing your technology instead of replacing it. You can imagine some of the benefits, such as an inviting, user-friendly way to learn and a strong method for developing and discovering new ideas and technologies. This is an amazing and interesting initiative and I agree with it wholeheartedly. One thing I'd like to mention more thoroughly is the concept of being free to fix your own technology. Instead of just junking your broken toaster, toy, phone, or computer, try cracking it open and fixing it yourself. You'll save money and it's more efficient than recycling, and you might even have some fun or learn something (gasp!) as you figure out how the object works and how to fix it. It also gives you a sense of ownership and connection; as the maker saying goes, "if you can't open it, you don't own it." With this comes some "rights" that makers lobby manufacturers for and strive to use themselves whenever making or developing something. These are quite interesting and make some good points. I've attached pictures of two motto/creeds/listings of rights. 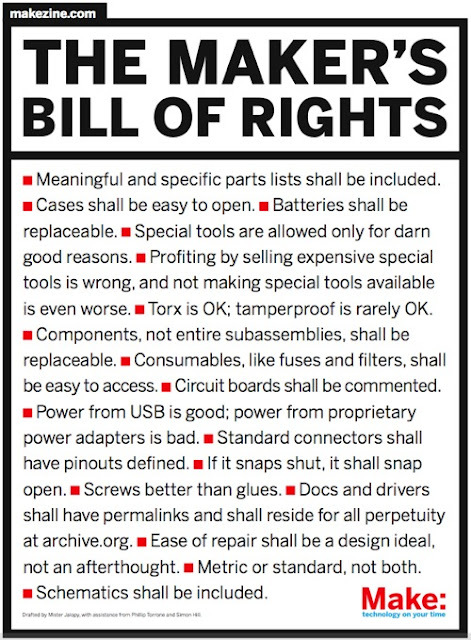 One is the Maker's Bill of Rights by Mister Jalopy. 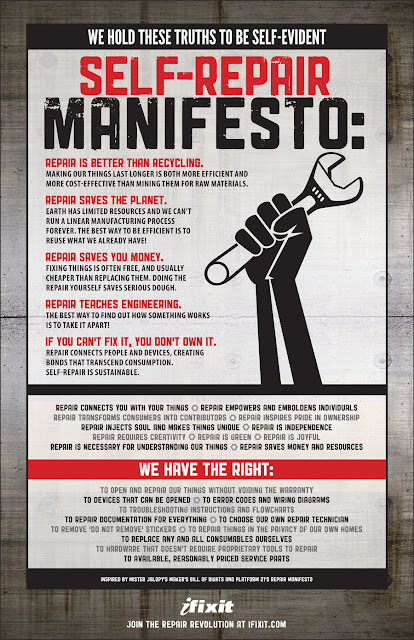 The other is the iFixit Repair Manifesto. iFixit is a website that instructs people how to repair their broken iPhones, computers, etc. so that they can be reused. I write this post after being reminded/inspired from my last project when I fixed our broken remote.